Home / Shop / Login with Facebook, shop faster! 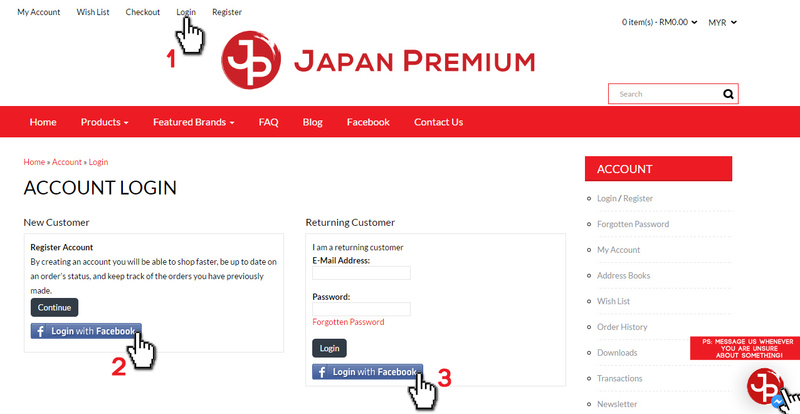 Login with Facebook, shop faster! Facebook has taken over the world. With the flexibility of it being able to be applied in almost anywhere, we have also implemented in our website for the ease of you. 3) When you are done with the registration, you can login with this button next time. Now you are ready to explore the vast amount of Japanese made products we have to offer! Psst ! Want to chat with us faster ? You can also get in touch with us via Facebook message! See our logo on the bottom right corner of the page ? Click on that and Facebook message us ! Come say hello to us !